Contents insurance or personal property insurance can help you replace the items in your home that you own if you have a theft, fire, or any other type of insured claim or loss. What Is Personal Property or Contents Insurance? The personal property coverage is what covers the items that you have in your home. The contents of your home are made up of all the different things that you have put into your home. Personal belongings include your clothing, electronics, jewelry, and essentially anything that is movable. Remember when you moved in? Well, everything you brought into your home at that time is what you should be considering as contents. How Do You Get Insurance for Your Contents or Personal Belongings? There are three ways to typically get insurance for your contents or personal belongings. All three of the above types of insurance policies provide some coverage for personal belongings, additional living expenses, and liability. Most people get home insurance because their mortgage requires it, but there are a lot more coverages included in your home insurance policy than you might realize. Additionally, every policy has special limits and exclusions which make knowing exactly what you are covered for complicated. Are Roommates Covered By Your Personal Property Contents Insurance? It can happen that good friends or roommates live together in a place where only one person has an insurance policy. It is very important to note that roommates are not covered by an insurance policy unless they are named on it. Therefore, if your friend owns a house and you live in it, and you are not a named insured on their insurance policy for personal belongings, then you are not covered for your things. You would need your renter's policy to cover you or ask to be added to their policy as a named insured. Are Family Members Covered By Contents or Personal Belongings Insurance? Family members are not the same as roommates. The definition of insured on an insurance policy includes dependents, like children. It also includes the spouse of the named insured. If you are unsure if a family member is included in the definition of insured on your policy, then your best bet is to contact the insurance company and ask them. Your agent or broker will be able to go over your specific circumstances and help you make sure you have the coverage you need. Are Your Guests' Personal Belongings Covered on Your Insurance? Although the personal property belonging to a roommate would not be covered on your contents, renters, or home insurance policy, the personal property of others while in your care may be covered. A lot of times we start to wonder about what will happen if our personal belongings are damaged or stolen when we have a big move. 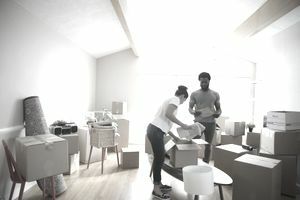 Your contents insurance may cover you while you are moving, be sure and ask your insurance broker or representative what is covered during a move because it can save you money if you find out you already have the coverage you are interested in. Are Personal Belongings Covered By Insurance When Not at Home? Your contents insurance will typically cover you for your personal property while temporarily removed from your premises in your possession, worldwide. For example, if you go on vacation, you will have some of your contents with you. If something should happen to your personal items, then your contents insurance could cover you just as if you were at home. Keep in mind, however, that they would be subject to a deductible unless you had the item scheduled on your policy and there was a no deductible clause. Pay special attention to any limitations in the special limits of liability section if you do plan to travel with items that are limited as listed below. What Kinds of Coverage Are Available for Contents? How Much Are Personal Belongings Insured for Under Contents of an Insurance Policy? For condos and renters, you decide the amount of insurance you need for your contents, and the premium for the policy is based on your estimate. For home insurance, the contents or personal property limit is usually a percentage of the insured dwelling amount, which is typically 50-70% of the insured dwelling value. In some circumstances, it may be increased or decreased if needed depending on your situation. You aren't usually charged for contents when it is part of the home policy. It is just a part of the insurance package when insuring your building just like additional structures are. Whether you have replacement cost or actual cash value coverage will determine how much you will be paid in a claim. Replacement cost coverage on contents means that the insurance company may repair or replace the item in the event of a loss. If you had to replace the item, you would receive the amount of money required to buy a new item. Actual cash value coverage means that you are covered for the value of the item less depreciation. This is a very limited form of coverage. Make sure and ask your insurance agent or broker what the basis of claims settlement is on your insurance coverage for your personal belongings. If it is actual cash value, you may want to ask for a quote for replacement cost insurance. What Is the Least Expensive Type of Contents Insurance? Actual cash value coverage is less expensive than replacement cost coverage because it pays you less in a claim. In many cases, it can pay as little as half of what it might cost you to replace the item. Named perils content insurance is also less expensive than open perils policy because named perils only cover you for the specified risks on the policy such as fire, smoke, lightning, vandalism, theft, and other items listed on your policy. You will only have coverage for the listed risks. This is why a named perils, actual cash value policy will be less expensive than a policy that covers you for all risks on a replacement value basis. Make sure and ask about how your contents are covered on the policy you have. Cheaper is not always better when you look at your insurance, so choose the right insurance for you. If you are trying to save now, imagine how difficult it will be in a claim if you can't get paid because you are not covered, or if you only get half the value of your property. A contents insurance policy is meant to cover your personal belongings, so if you work from home, or have equipment or stock items that are business related, your coverage may be limited. Make sure and inquire about these items specifically so you know if you need to add coverage, or if it is already included. The deductible represents the portion of a claim that you will pay for yourself. If you take a higher deductible to save money on insurance, then even though your contents are covered on a policy, you may not be able to make smaller claims because the value of the claim may not be worth it. We've gone over what is covered by contents insurance and some circumstances where people's property in your home may or may not be covered. There is one more area when it comes to insuring your personal belongings that you may want to learn more about: high valued items, or items that may not be easily replaced. Your insurance policy may offer you the option of adding coverage for special items of high value, like jewelry. If you have items like antiques or special collections, jewelry, or even musical or photographic equipment, you may want to add a rider to the policy to make sure you are covered. In cases like this, you may not even have a deductible because you are paying extra. Special items sometimes require special insurance, so be sure and inquire about anything that you may be especially concerned about. Finally, there is one other option for contents and personal property insurance that you may be interested in if you feel that the value of your contents is exceptionally high. There are high-end insurance policies that will have higher special limits, fewer exclusions, as well as better claims settlement options, such as no obligation to replace policies. Ask your insurer if they have a policy covering open perils on contents and no obligation to replace with replacement values. They may have options for higher-end policies than the one you originally discussed. If not, then there are other options. If you feel like the value of your personal belongings are valued from $100,000-$200,000, then you might consider looking into High-Value Specialist Insurance Companies. These companies will provide you with policies that may be a little more expensive but may offer coverage that suits your lifestyle better if you are concerned that the basic policies are too limited for your needs. Working with companies like this for your insurance will make the claims process much easier.